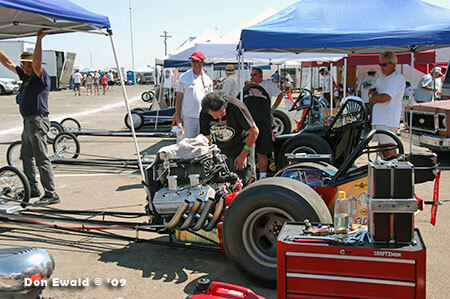 June 26-27, 2009 - Sacramento, CA. 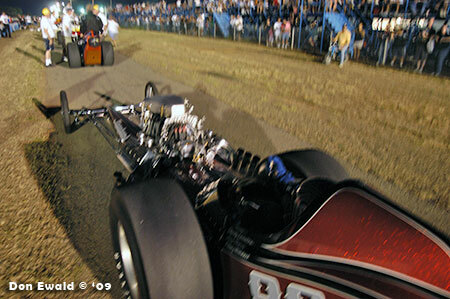 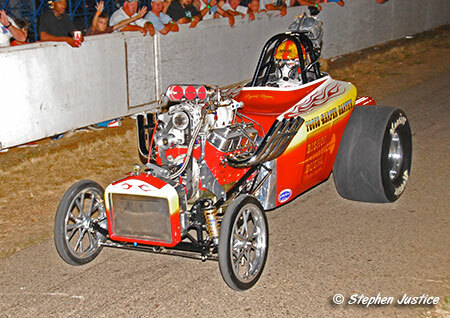 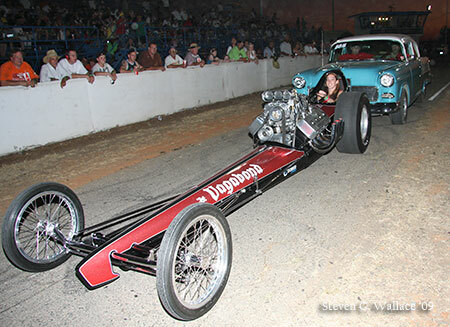 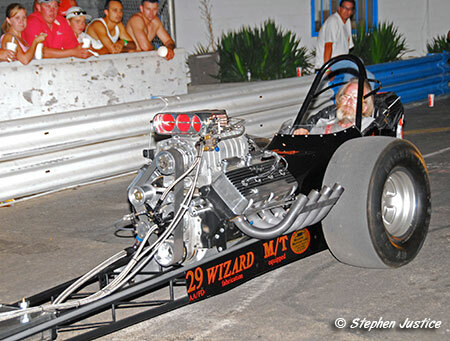 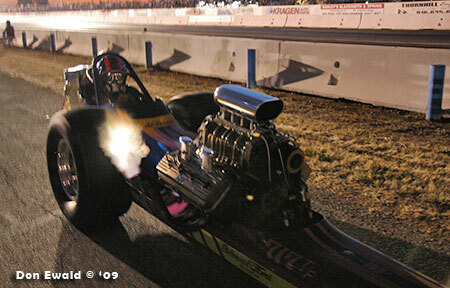 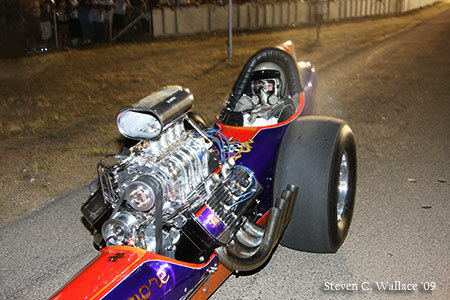 : The 33rd Nitro Nite of Fire featured a new and exciting format promoted by Lee Paul and Lisa Jennings. 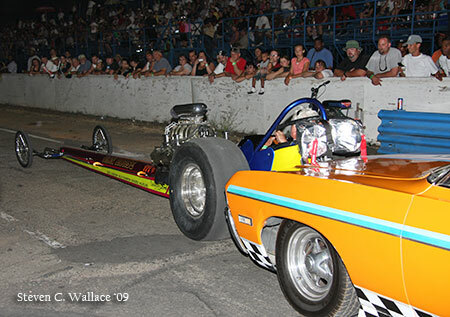 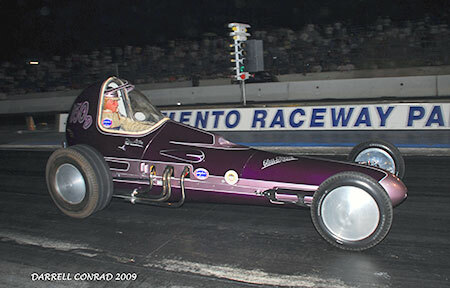 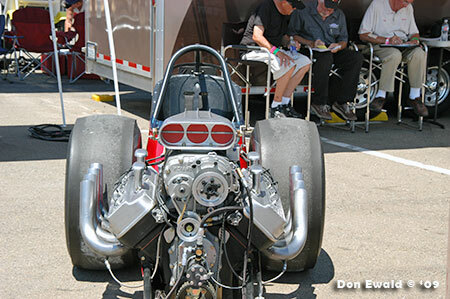 Added to the nitro funny cars, fuel Altereds, Pro Mods and jet cars was a select field of cacklecars featuring mostly NoCal entries. 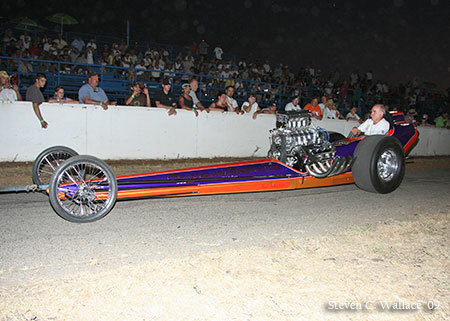 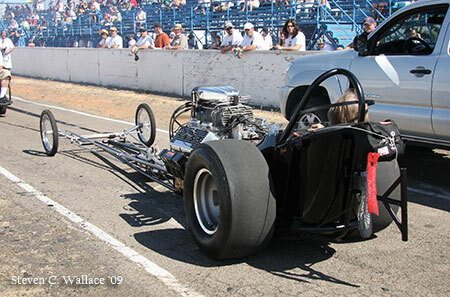 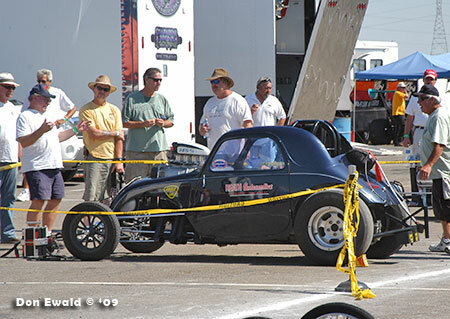 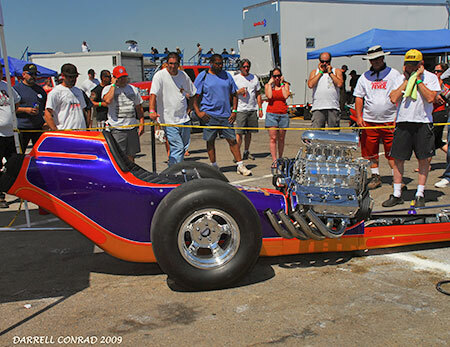 This was the first organized cacklecar event in NoCal and the first time the Sacramento fans had seen these kinds of cars in action. 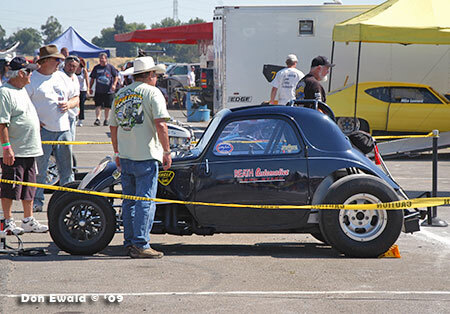 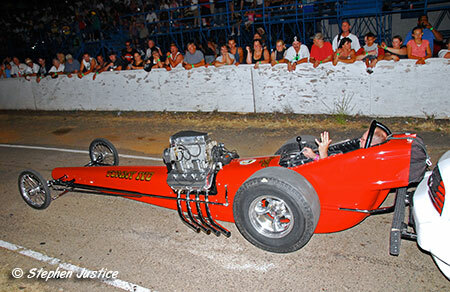 Like all Cacklecar events, this one is better seen than just talked about so without further ado - here is the inaugural Cackle Mania from tropical Sacramento. 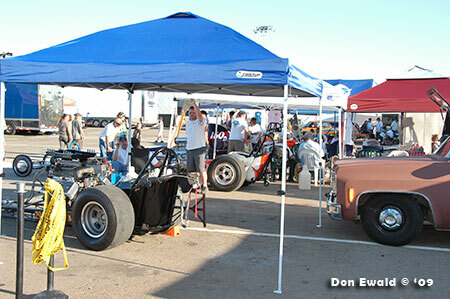 With the temp hitting the 100 degree mark, Friday found everyone setting up without any indication of urgency. 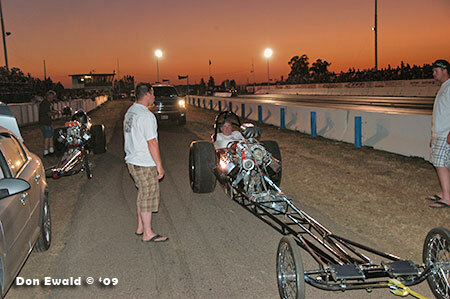 The Anderson's were the first ones to the track with the Vagabond and were pretty well set up by the time others started arriving. 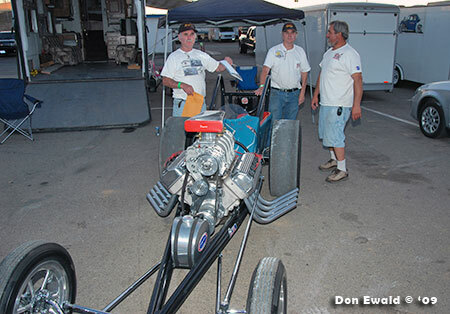 Ron Johnson, who arrived second, enlisted the help of fellow cacklers to get his Barnstormer out of the box and under some shade. 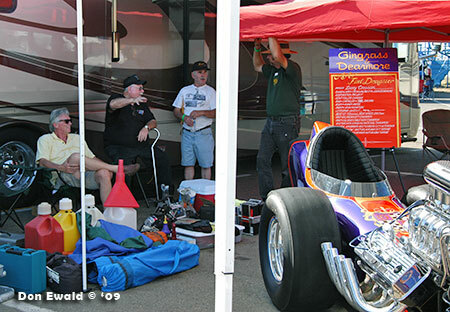 John Dearmore and owner Larry Crossan set up the beautiful Gingrass & Dearmore car next to the Vagabond. 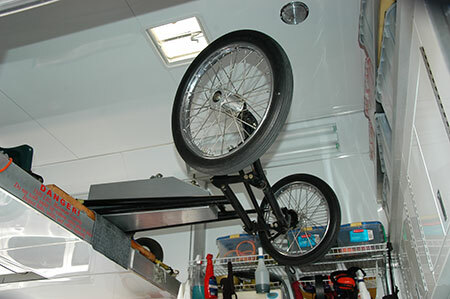 The Shubert & Herbert car rides in the penthouse of the Johnson trailer and descends on a cool power wench platform. 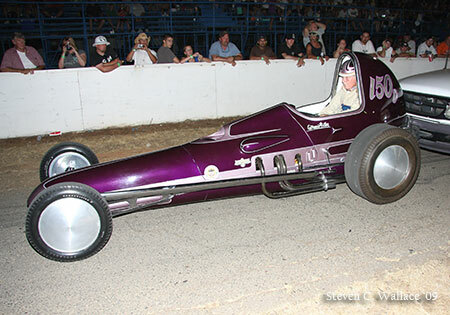 Next to the Johnson camp was the Ewell-Bell-Stecker-Olson car, owned by Bill Steckers nephew, John Kiley. 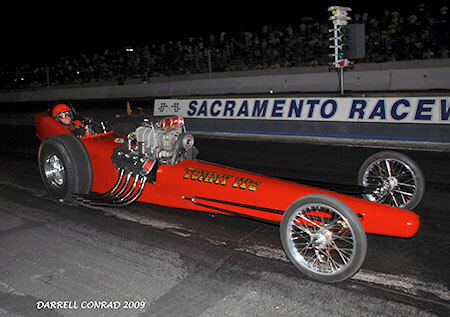 Kiley lives within a couple of miles of the track. 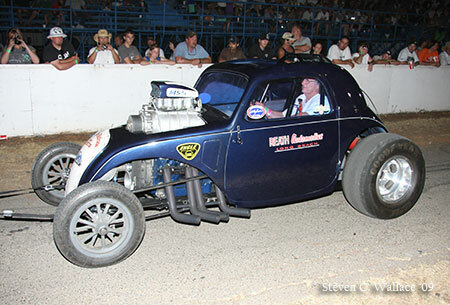 Steve Gibbs was on hand to have some fun but as is his style, ended up being the lead horse in the cacklecar show Saturday night. 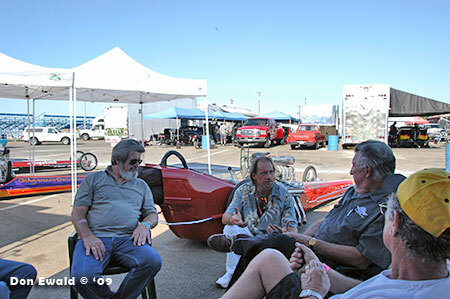 John "Tarzan" Austin (center) made a surprise appearance and added a few of his legendary tales to the mix. 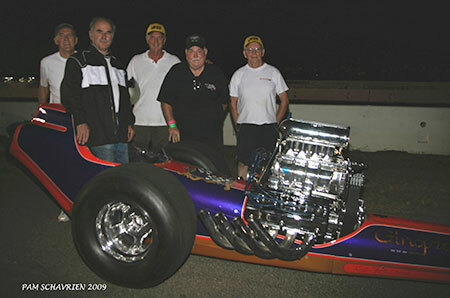 The Hampshire Bros. with the Schrank car. 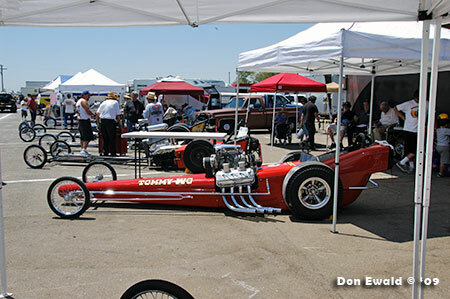 If you didn't like the heat on Friday, you really weren't going to like it on Saturday. 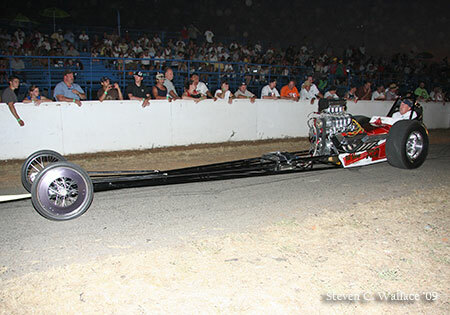 Promised to be the hottest day of the year in Sac, it didn't disappoint. 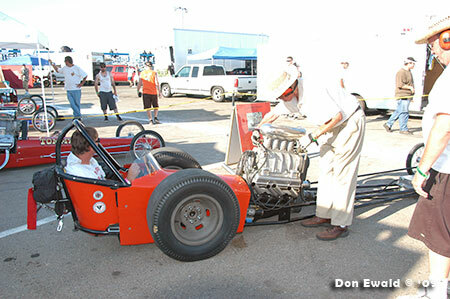 The first fire-up of the day was Bob Hirsch in his Marvin Schwartz "Anaconda" with Jake McCloud manning the starter. 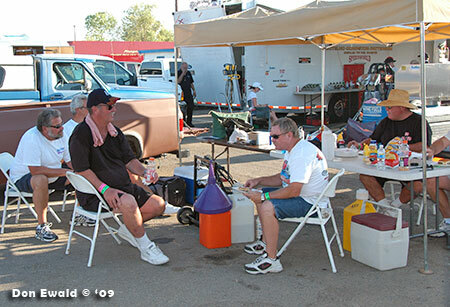 With the players set up it was a long day in the heat. 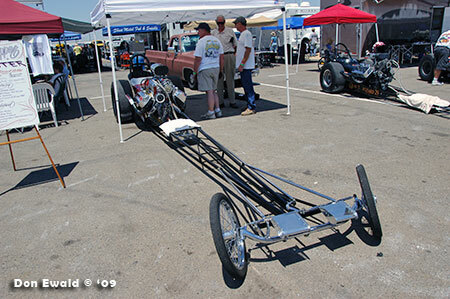 Alan Jaynes was on hand with his restored Jim Herbert fueler. 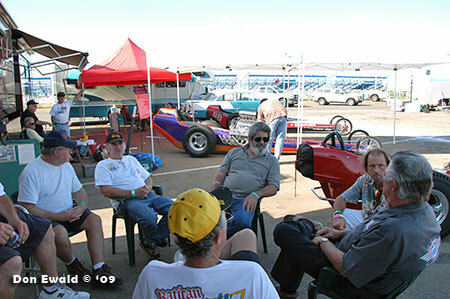 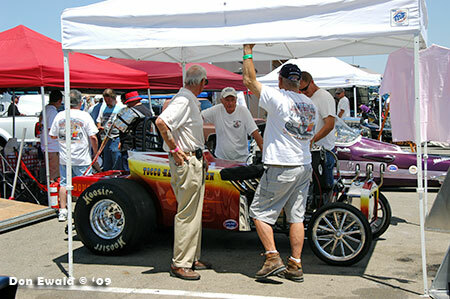 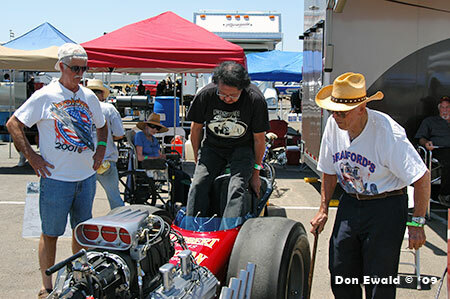 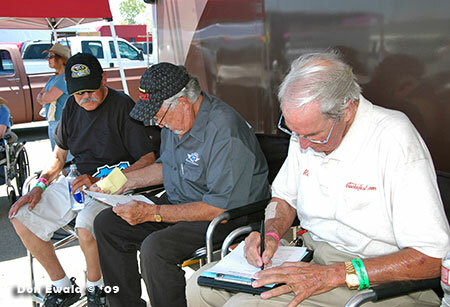 Gene "Geno" Gastelum, Steve Gibbs and Ron Johnson go over the entry and release forms for the cacklecars. 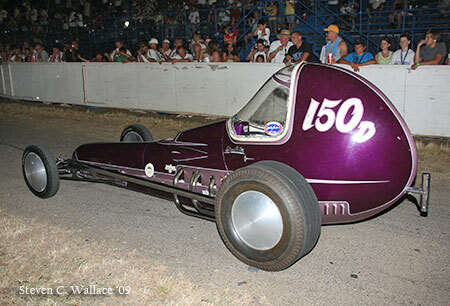 This also marked the debut of the completed Roger & Julie Lee's repop of the Brissette and Sutherland "Grenadiers" with fresh paint by Low-Low, lettering by Nat Quick and a running engine by Pops Bradford. 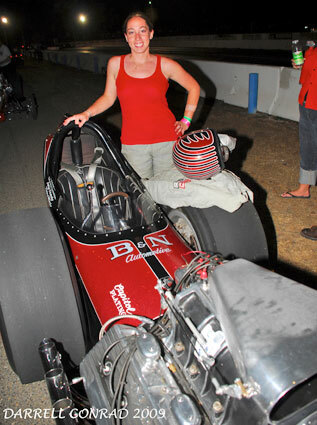 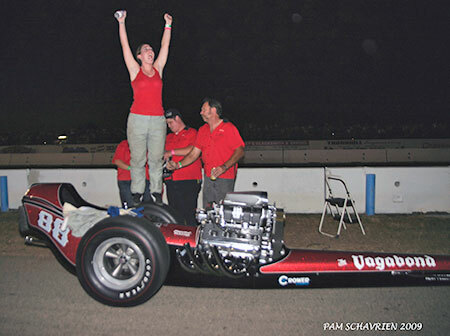 The next "driver" to subject themselves to the heat was Jessica Anderson for a fire up in the Vagabond. 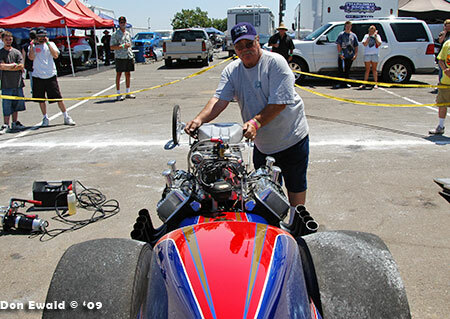 A little later it was time for Roger Lee to see if his dream would actually come to life. 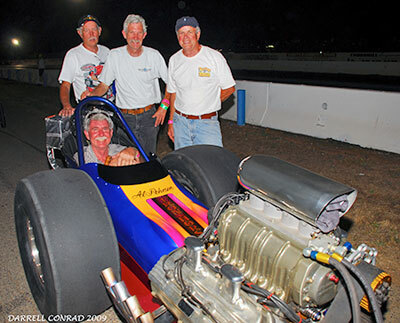 With the help of "Pop" Bradford, Mike Drake, Ken Riley and Rich Ruggerio, they attempted its first start ever. 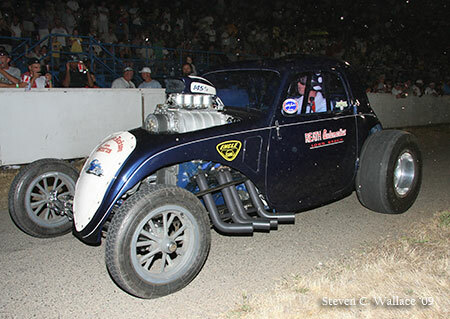 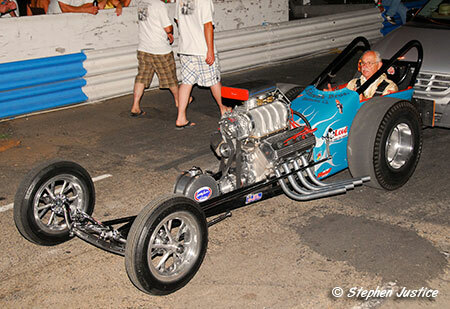 Now Pop, even at his age, can still build, tune and fire a 354 fuel hemi. 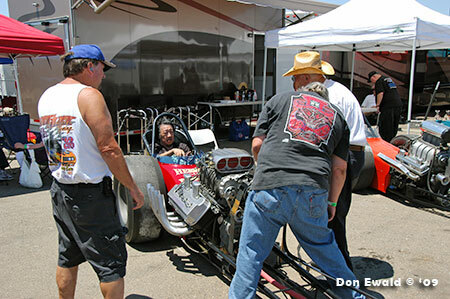 Mike on the other hand was suffering from the heat and never started a fueler. 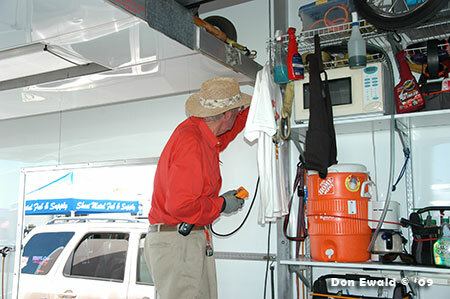 We went over the procedure a few times at the house, but showing and doing are two different things in 106+ heat. 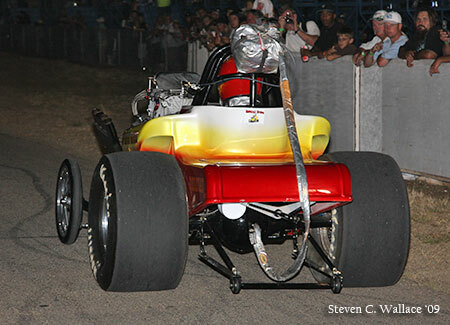 He had crewed on Super Modifieds, but those are different animals. 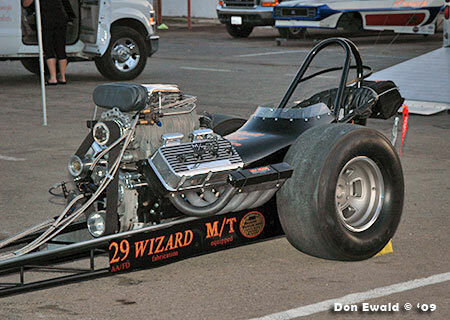 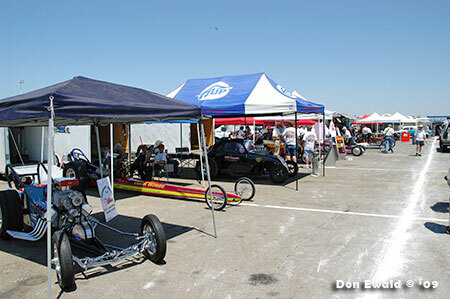 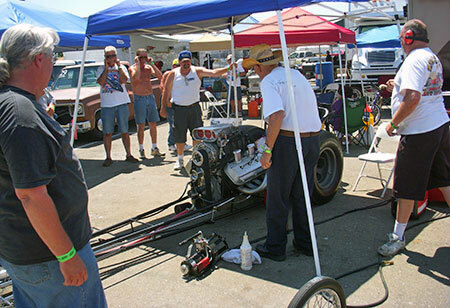 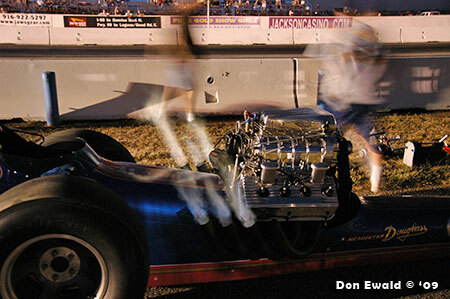 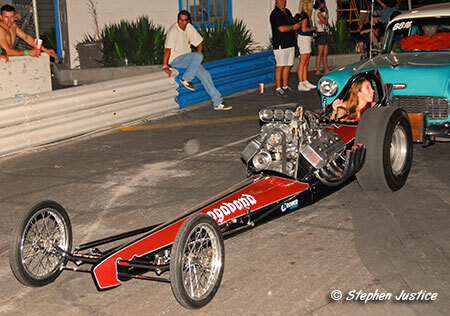 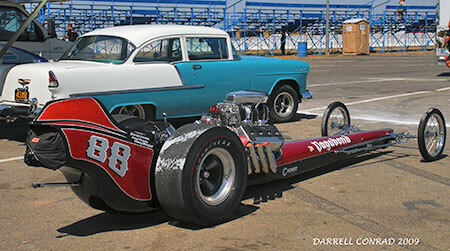 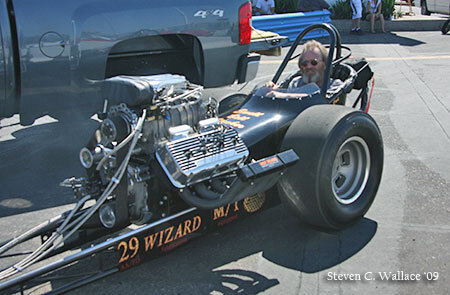 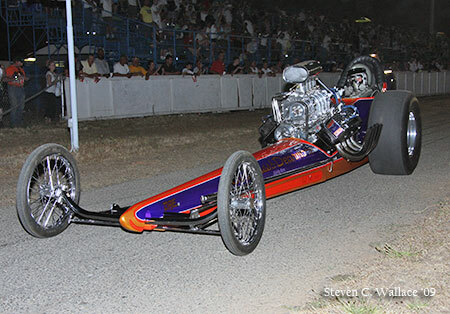 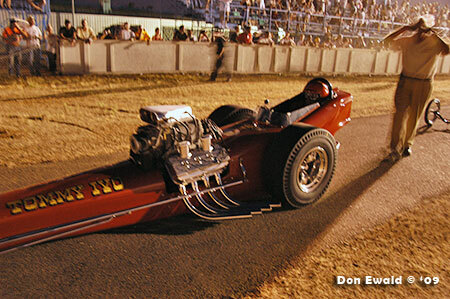 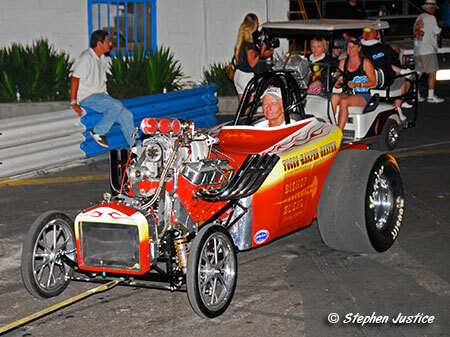 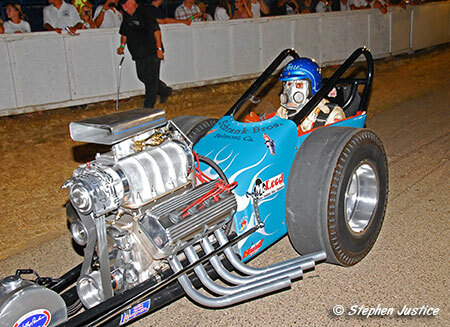 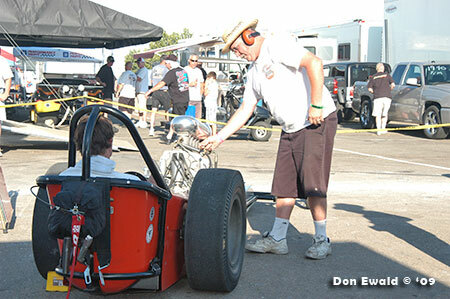 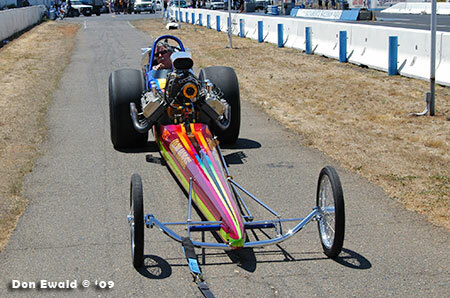 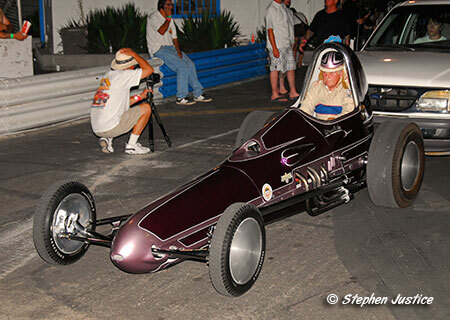 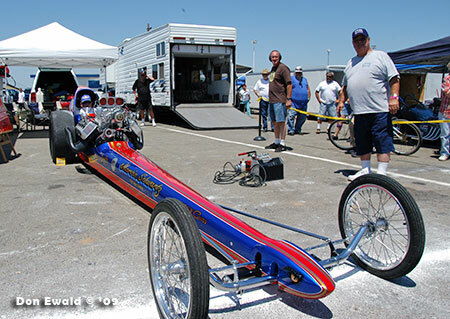 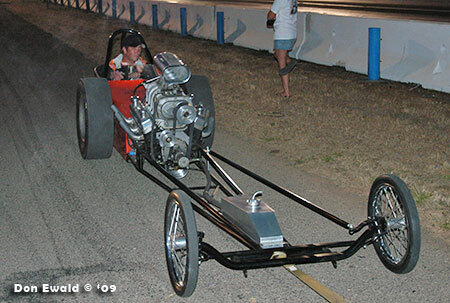 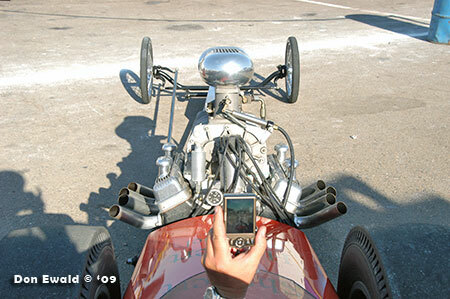 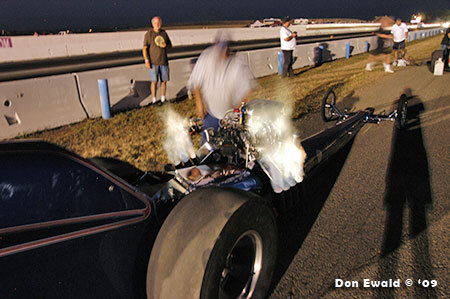 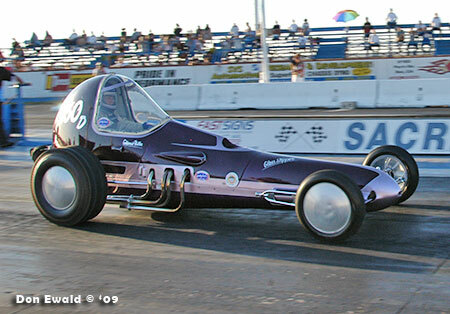 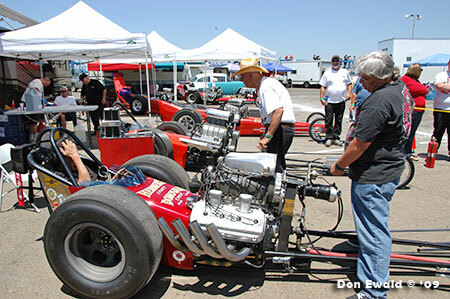 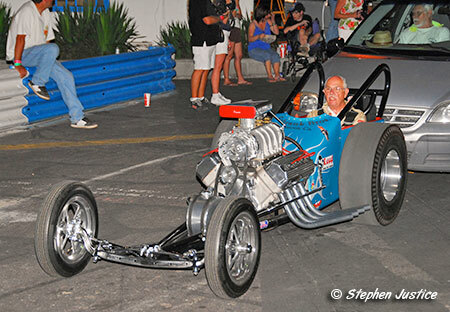 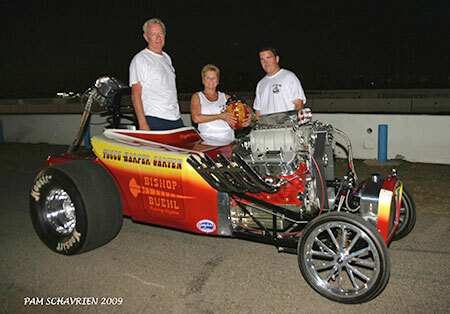 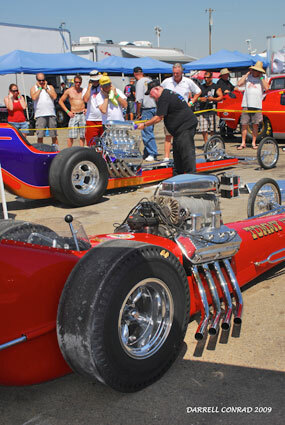 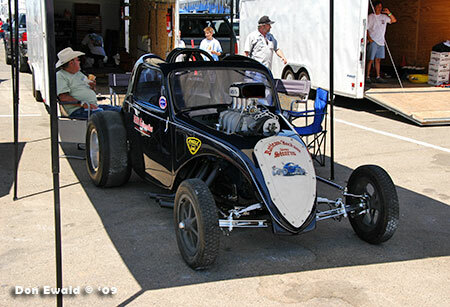 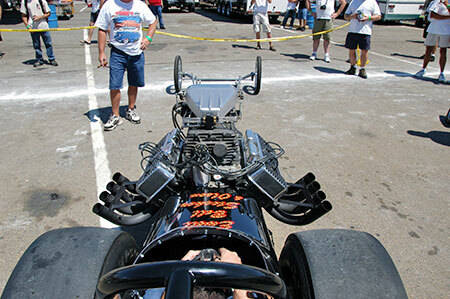 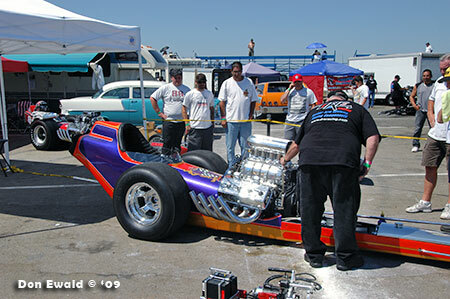 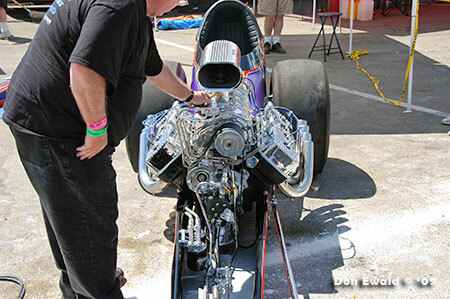 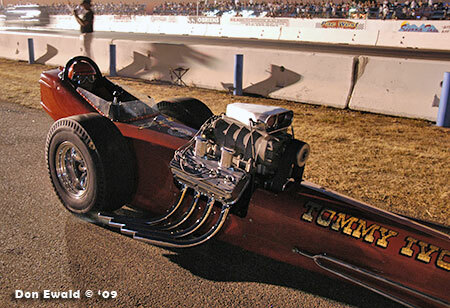 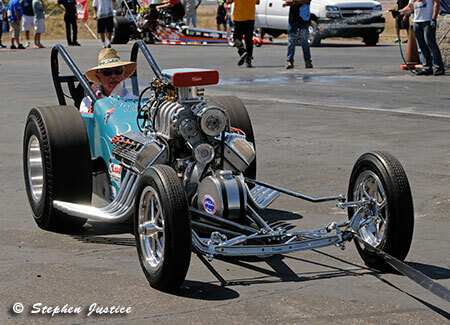 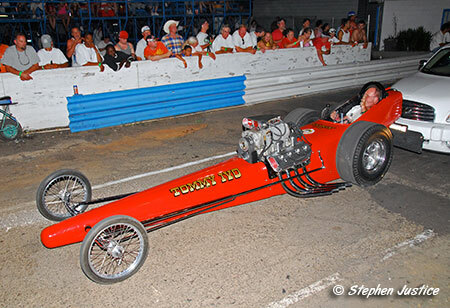 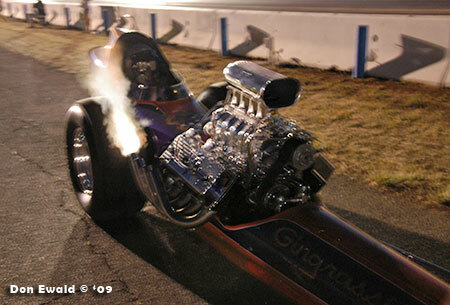 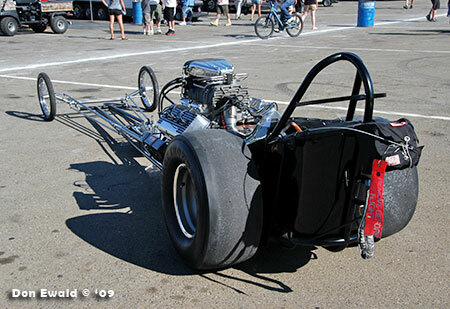 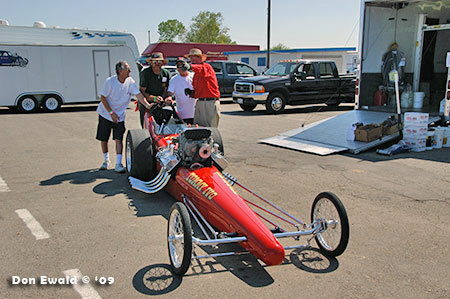 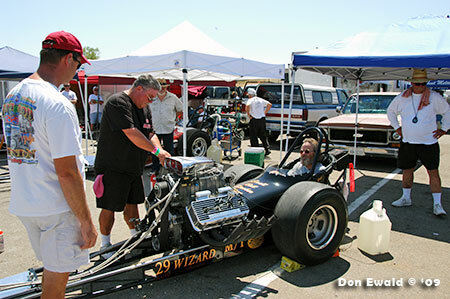 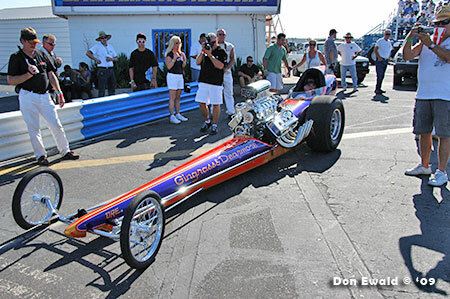 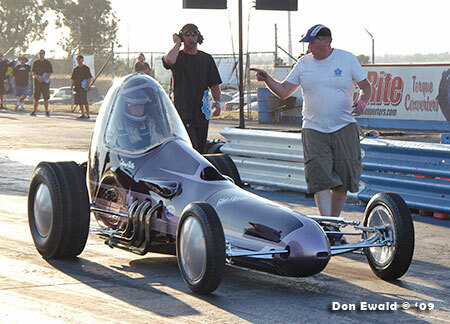 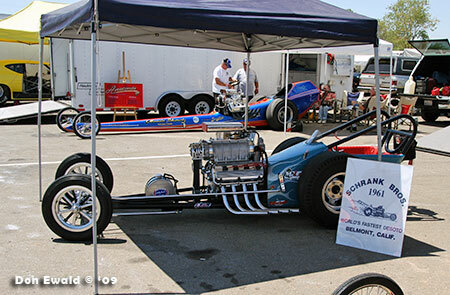 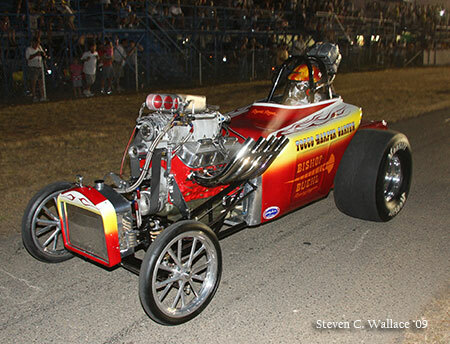 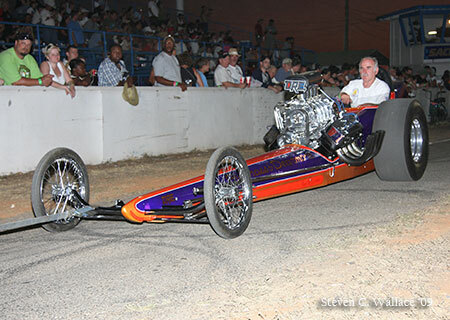 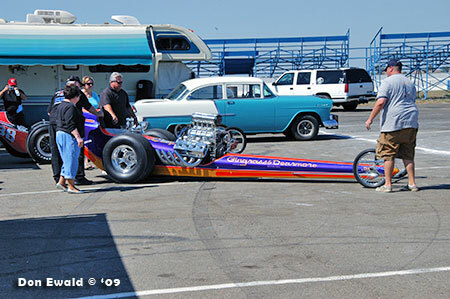 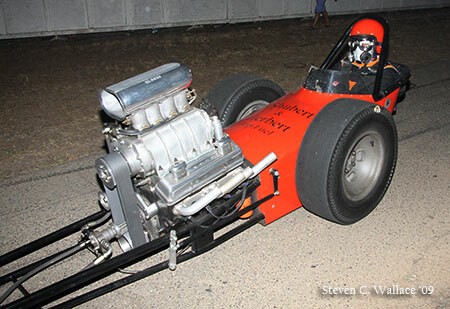 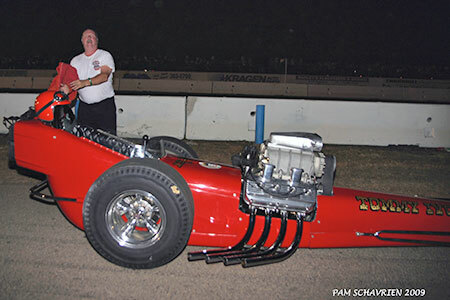 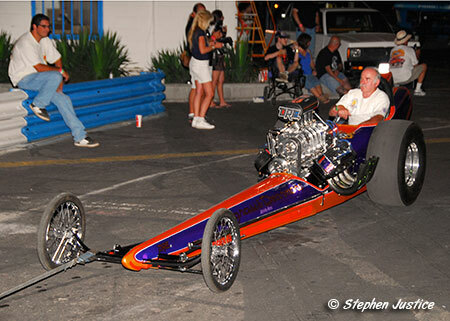 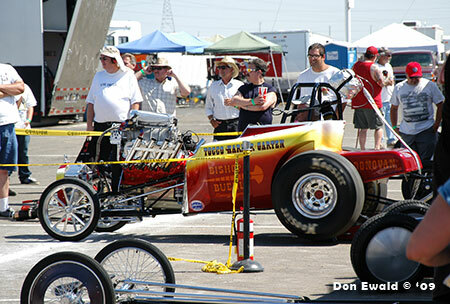 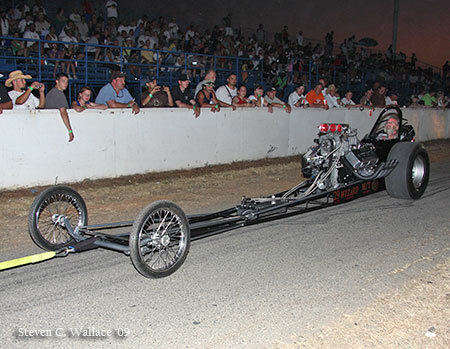 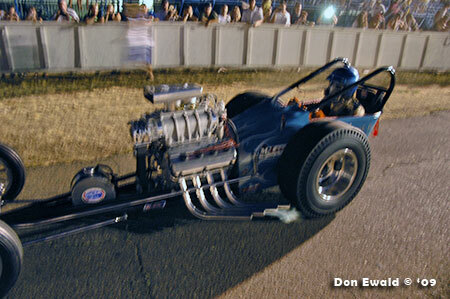 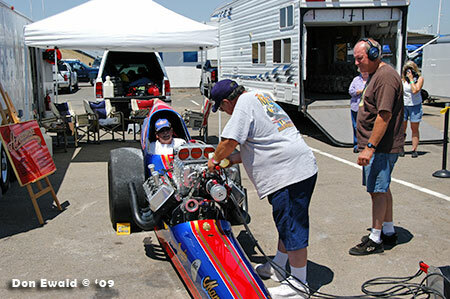 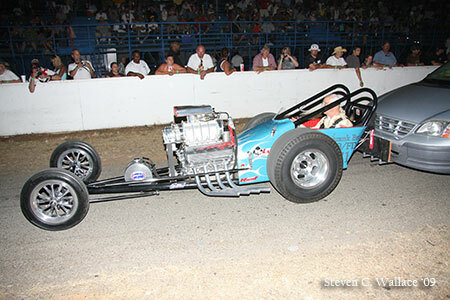 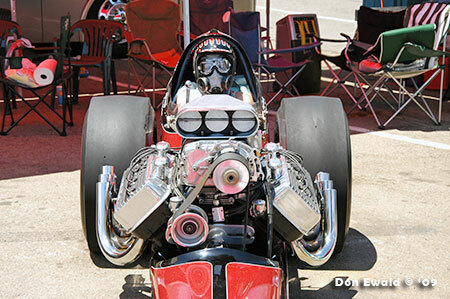 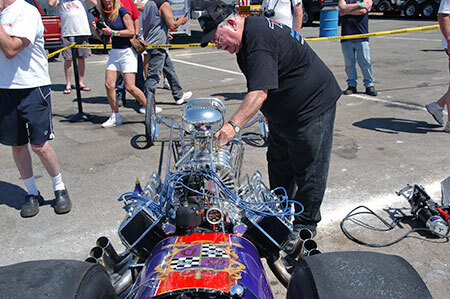 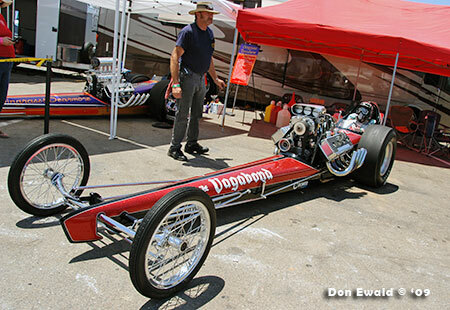 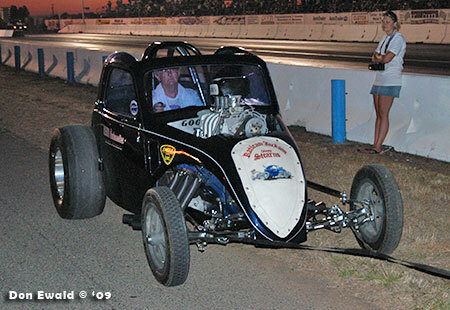 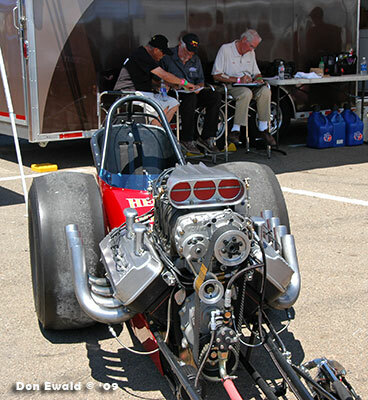 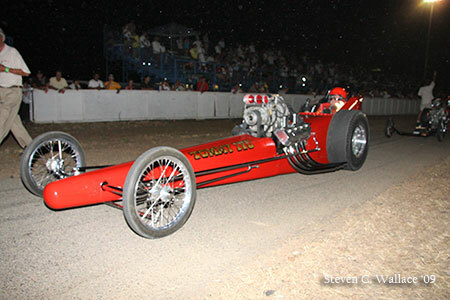 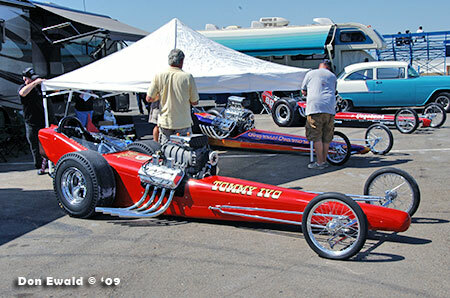 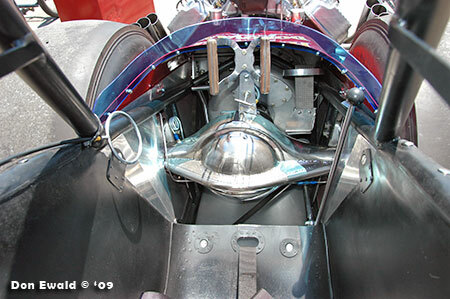 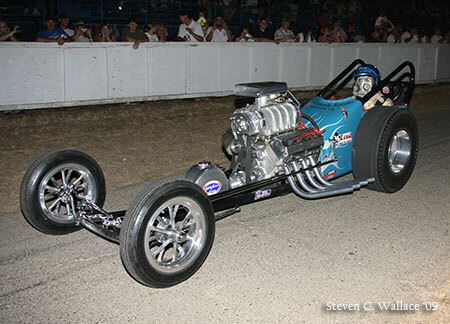 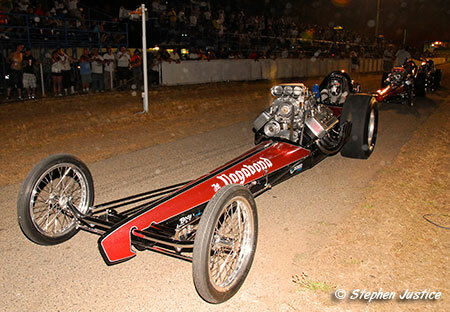 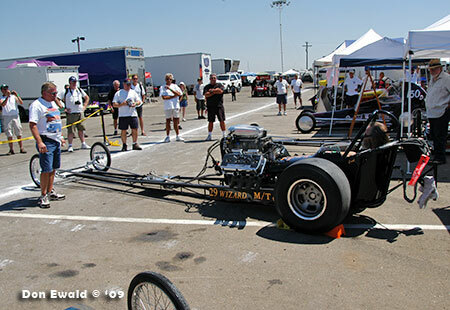 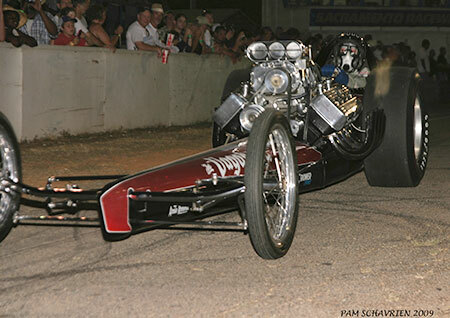 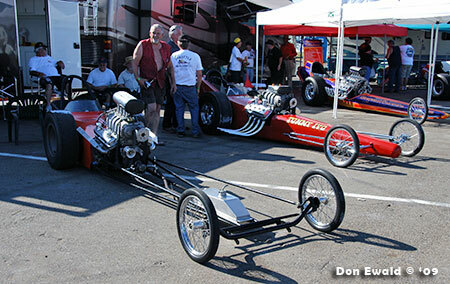 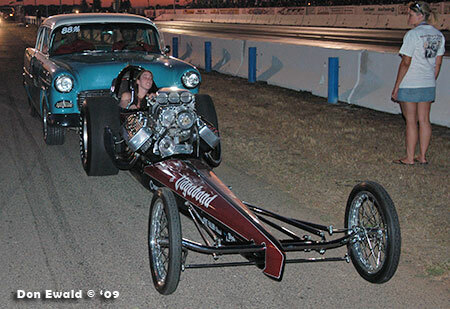 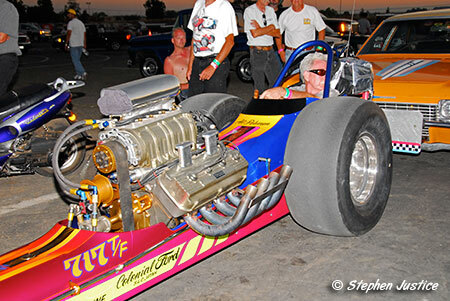 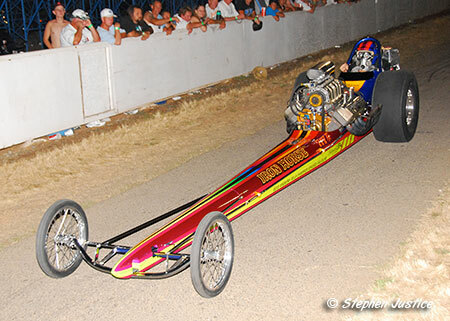 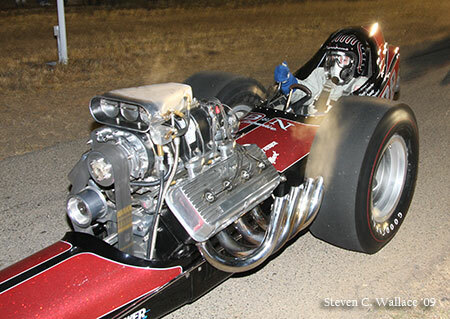 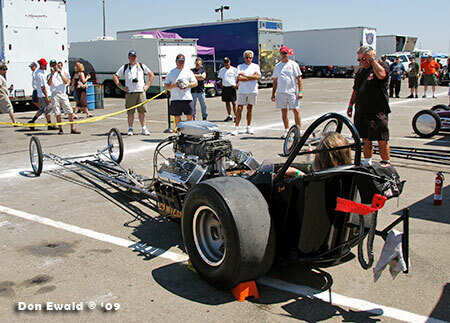 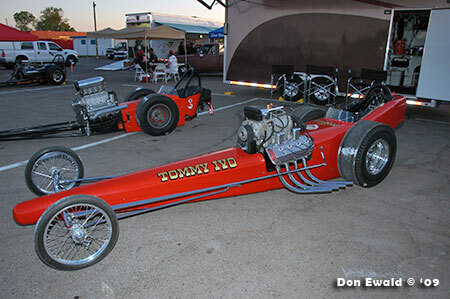 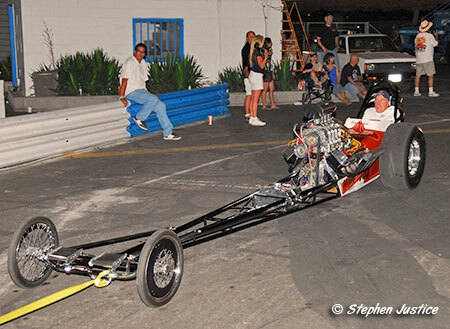 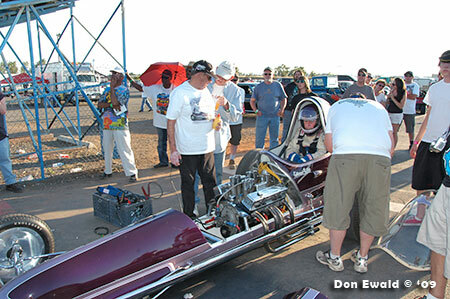 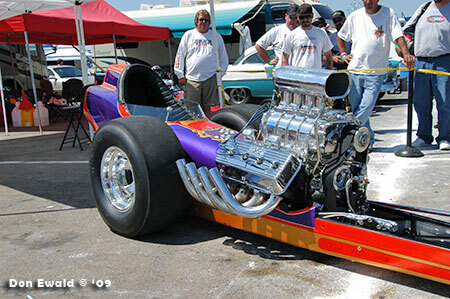 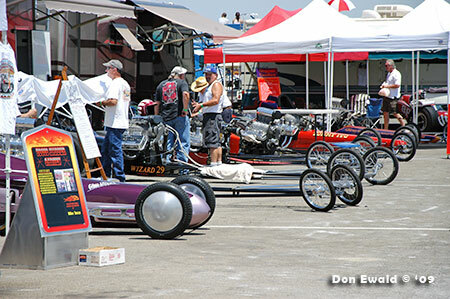 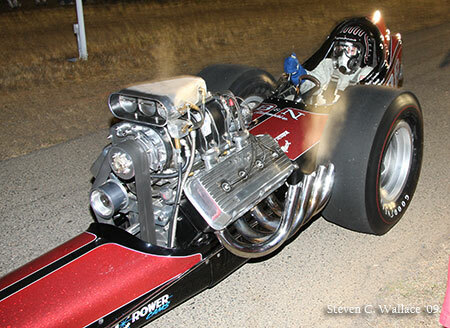 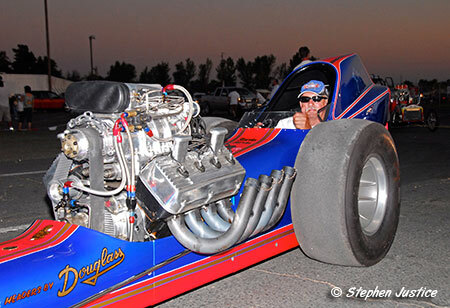 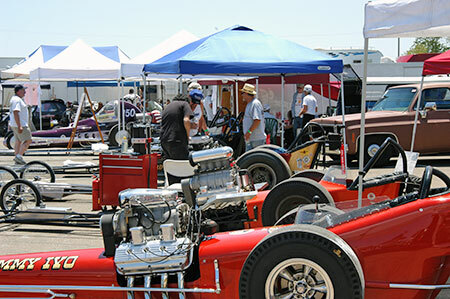 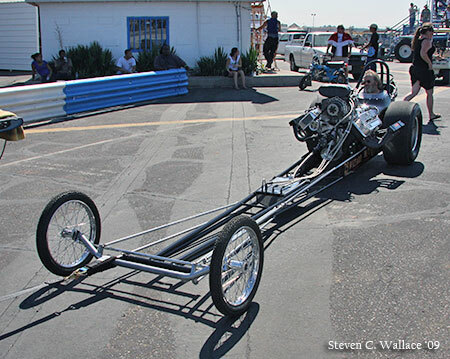 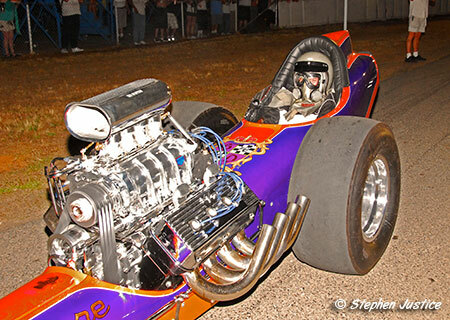 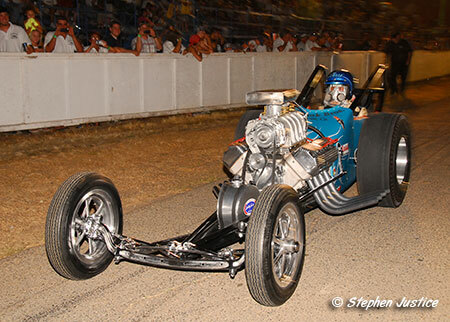 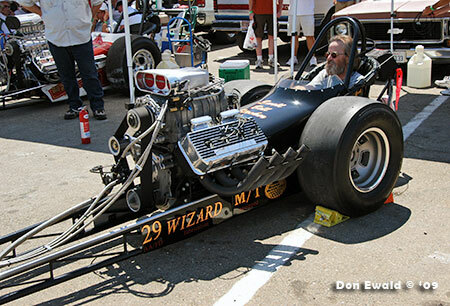 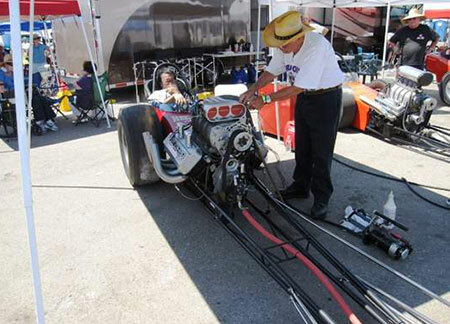 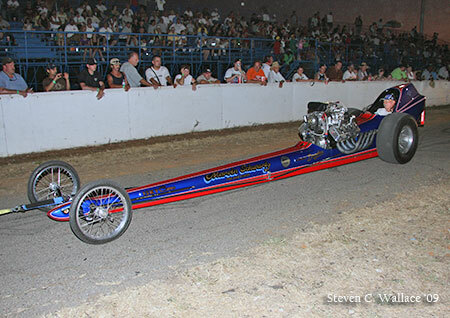 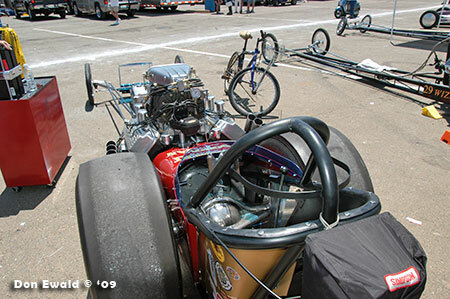 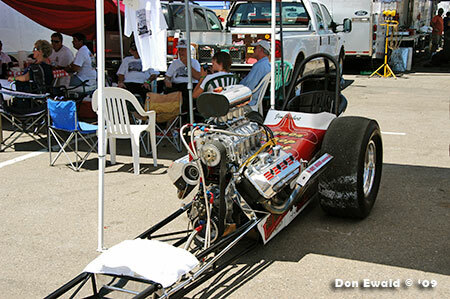 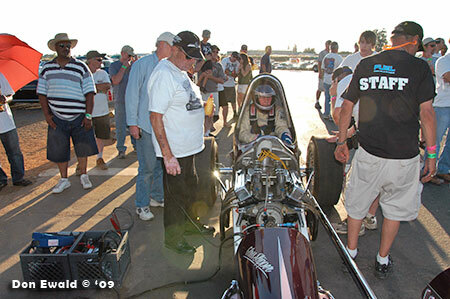 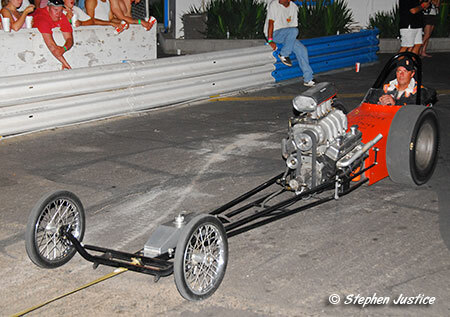 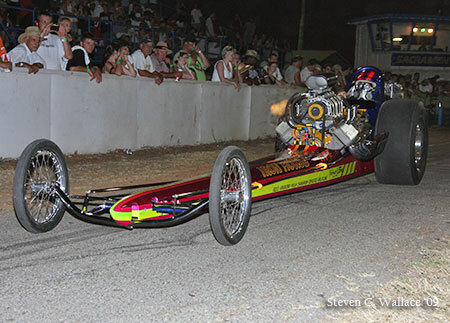 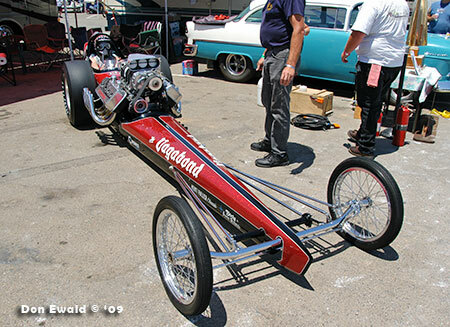 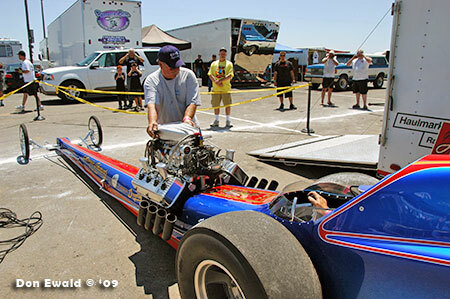 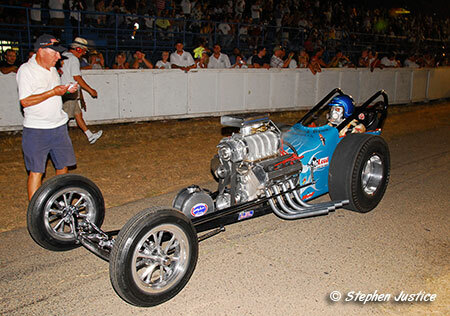 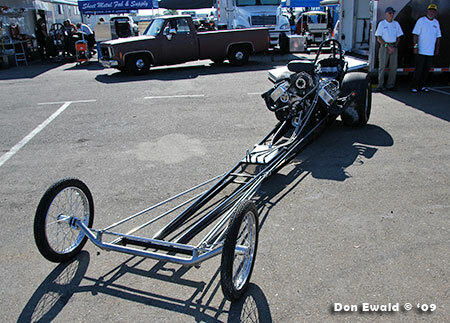 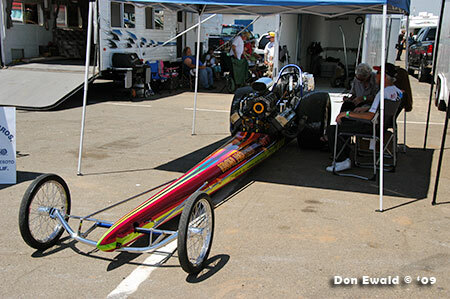 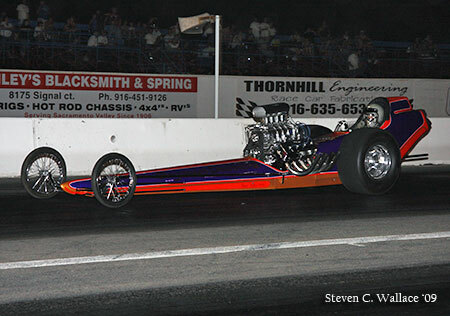 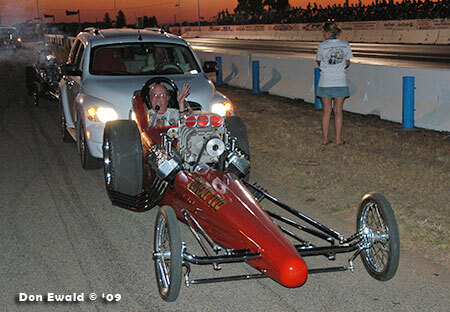 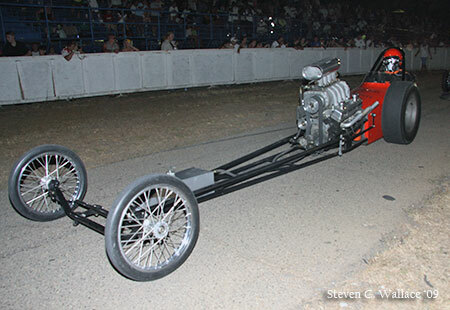 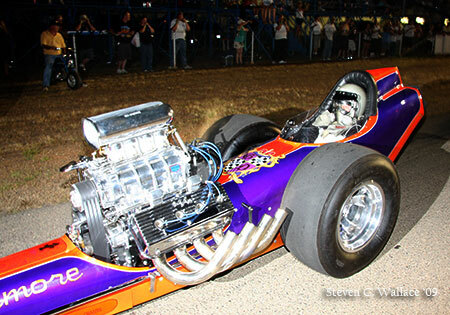 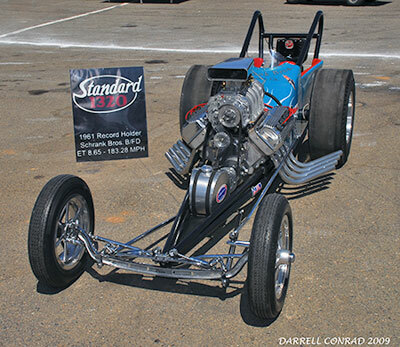 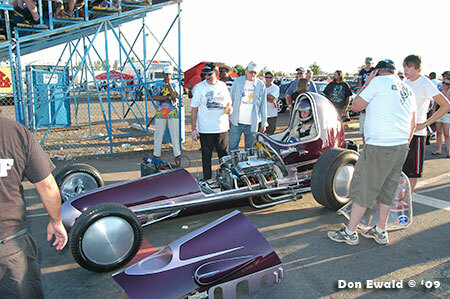 When Jim Brissette saw his recreated Fueler at the March Meet, he said it was too clean. 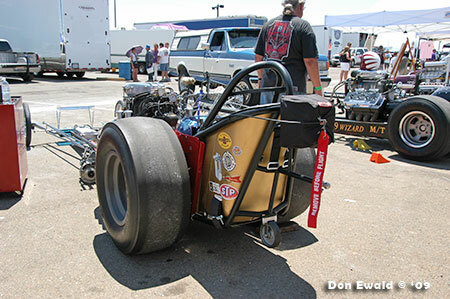 It's getting down and dirty now. 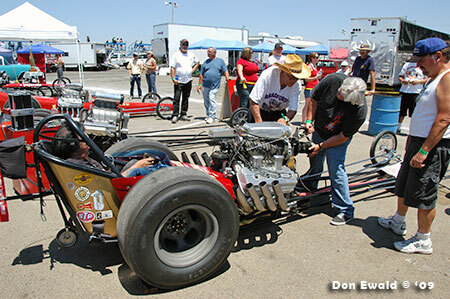 Pops is giving the Brissette Bomb another flat fatter. 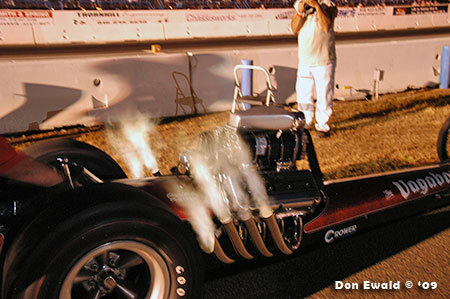 Note the flames in 106 temps. 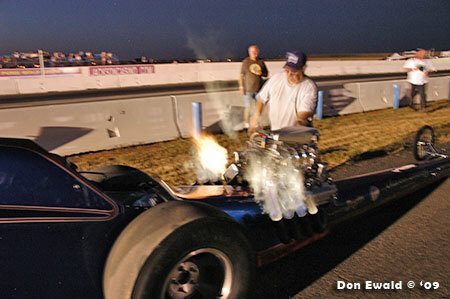 After a few minor adjustments, the first fire up was a success. 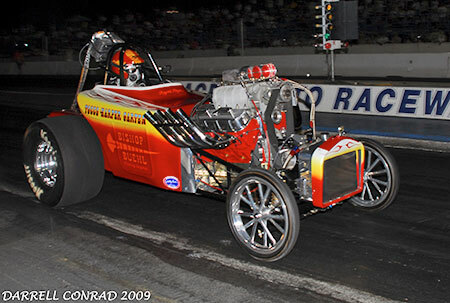 Another step closer to the Cacklefest. 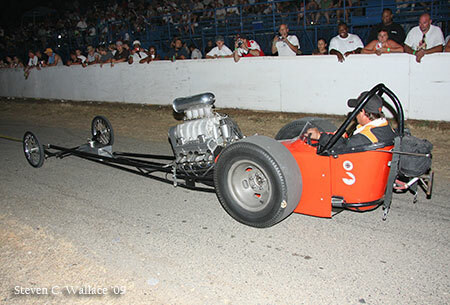 Throughout the afternoon the cacklecars were taken one at a time in front of the stands while the announcer touted Cackle Mania that night. 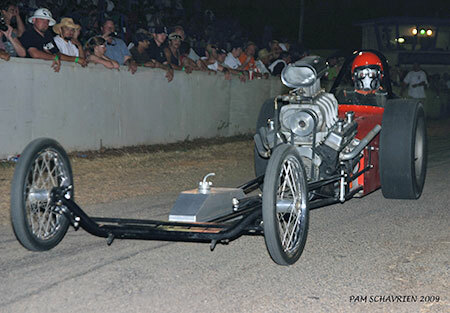 Sam Chastain in the Iron Horse was the first to go. 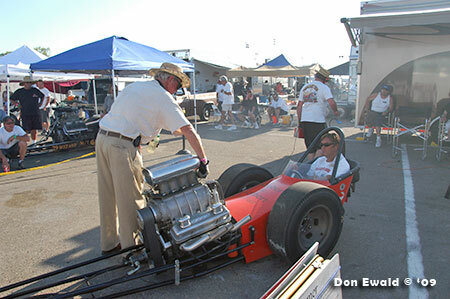 Back in the pits the next car to warm up was the Ewell-Bell-Stucker-Olson entry. 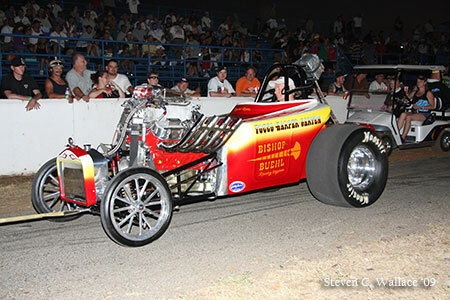 Jesse Schrank in the Schrank Bros. B/FD did their preview in front of the stands. 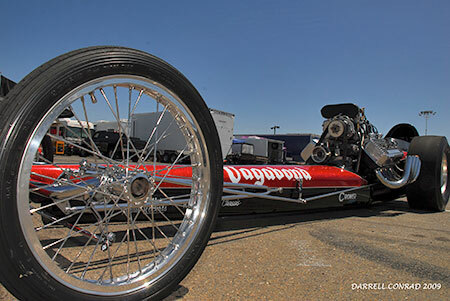 John Dearmore proved without a doubt you don't need a "driver" to fire a dragster and it left more than a few fans scratching their heads. 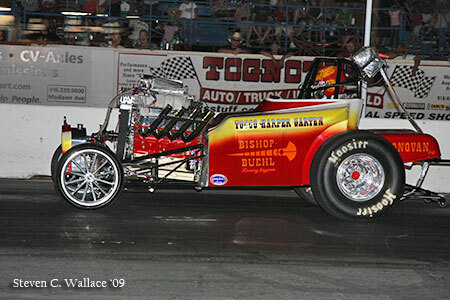 Roger Garten heated up the Tocco-Harper-Garten AA/FA. 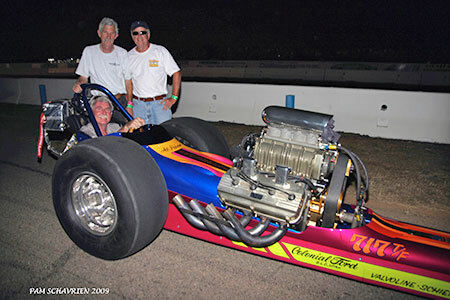 Ron Sterns then fired the Ratican, Jackson & Stearns altered. 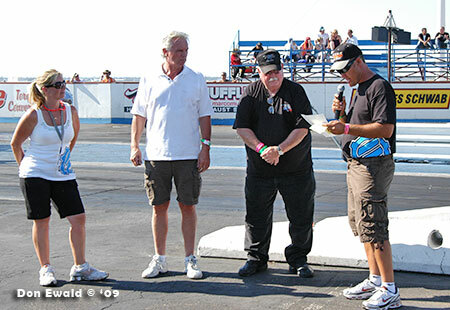 During the pre race ceremonies Lisa Jennings watches as Lee Paul Jennings emcees the presentation of the Best Appearing Cacklecar to Larry Crossan and John Dearmore. 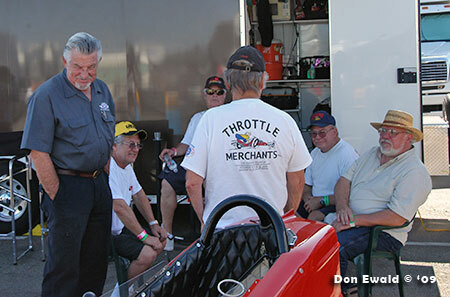 Ronnie Hampshire in the seat. 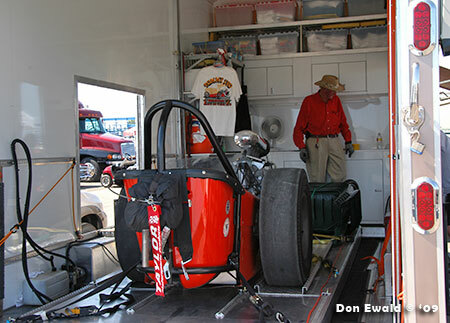 With the sun finally starting to go west Ron Johnson fired his Shubert & Herbert car with Marc McCormack in the seat. 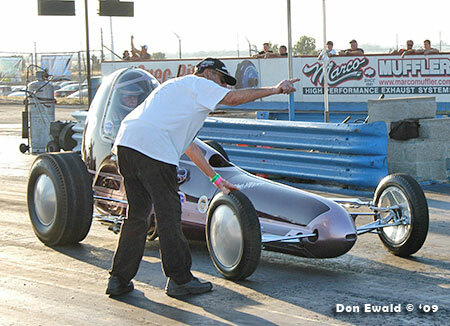 Late in the afternoon the crowd got a real treat when Ed Cortopassi strapped in to make a pass in his famous "Glass Slipper". 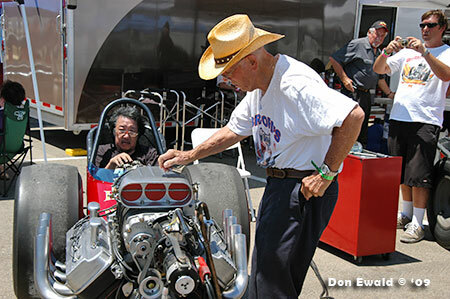 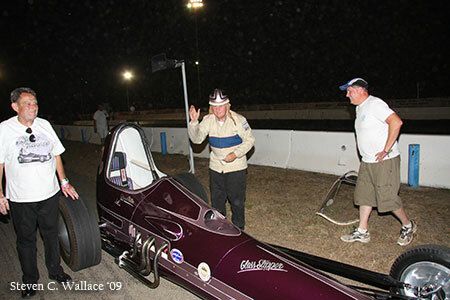 Unless someone can prove us wrong, we believe Ed (well into his eighties) is the oldest drag race driver on the planet. 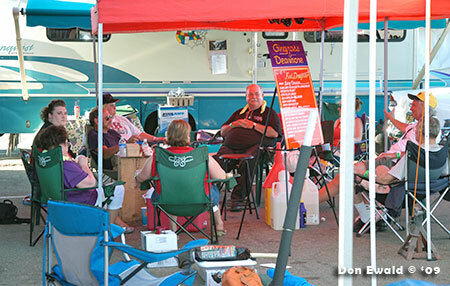 The Jennings' wisely waited until the sun was almost down to host the inaugural Cackle Mania - parade and all. 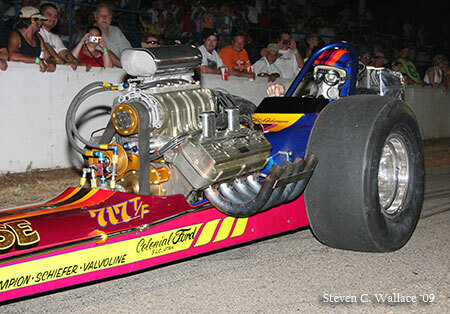 With 12 cars it was decided to put them in the order they last raced - the newest to the oldest. 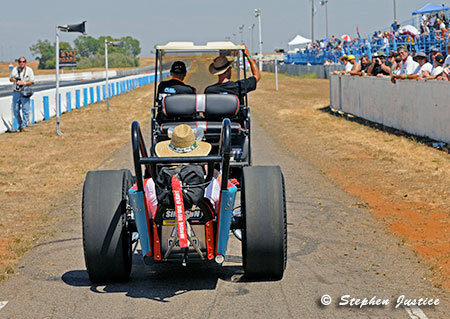 In hind sight we will probably do it in reverse next year as the ground pounders were all quiet by the time the rather timid Glass Slipper did its push start. 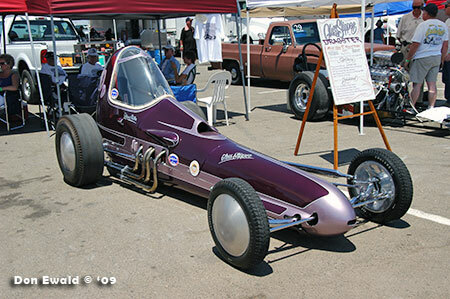 Be that as it may, here are the cacklecars at Sac. 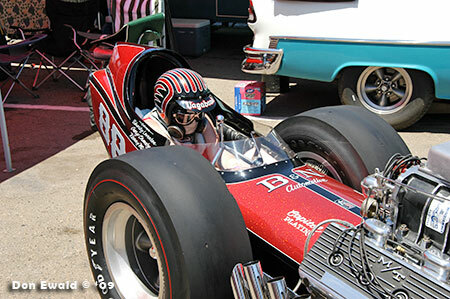 First out was Sam Chastain in the beautifully restored Iron Horse. 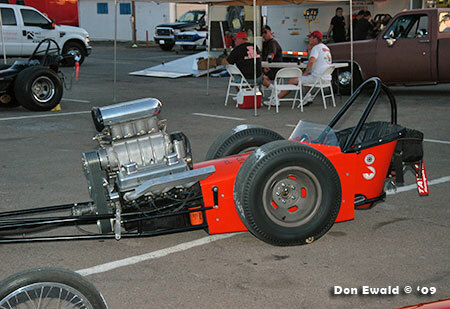 The 1968 version of the Ewell-Bell-Olson car that car went on to get a late model hemi and full body in 1969. 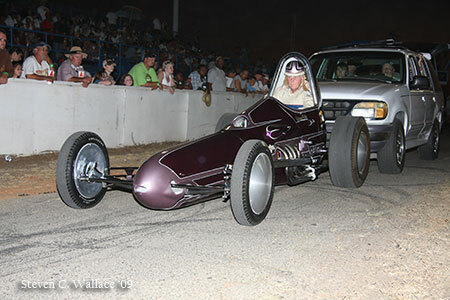 No ID on driver. 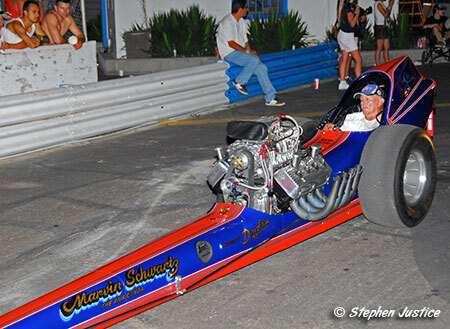 Bob Hirsch in the stunning Marvin Schwartz "Anaconda". 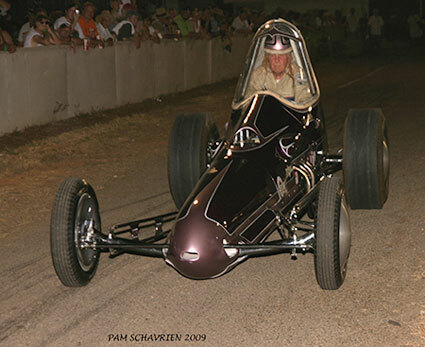 Original driver Roger Garten in the Tocco-Harper-Garten AA/FA. 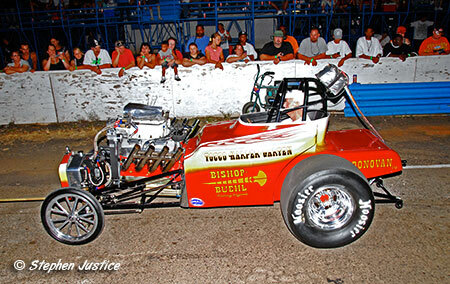 The Raynor Bishop Herbert AA/FD. 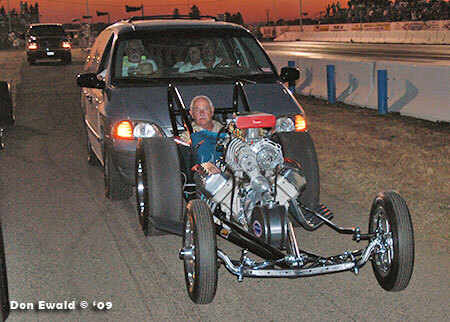 No ID on driver. 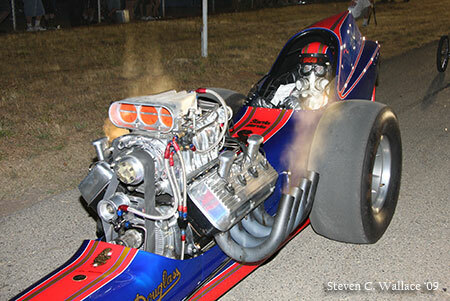 Ronnie Hampshire got the seat in the Gingrass & Dearmore fueler. 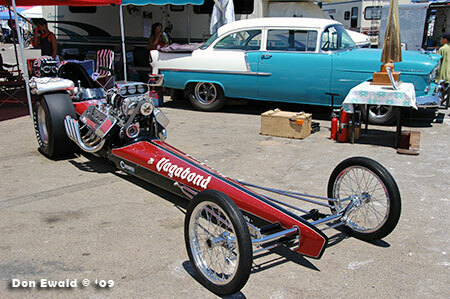 Jessica Anderson seems to have gotten a permanent ride in the families Vagabond entry. 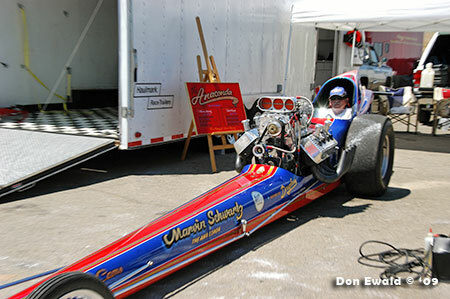 Marc McCormack was in Ron Johnson's Shubert & Herbert Chevy fueler. 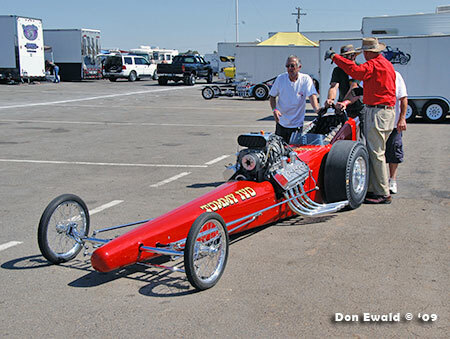 Kol Johnson got the call for the Tommy Ivo "Barnstormer". 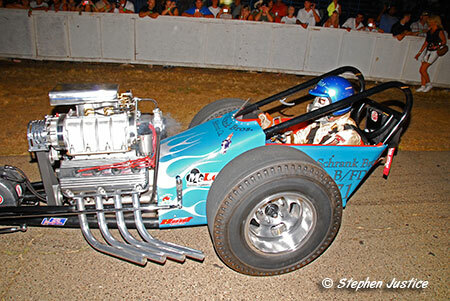 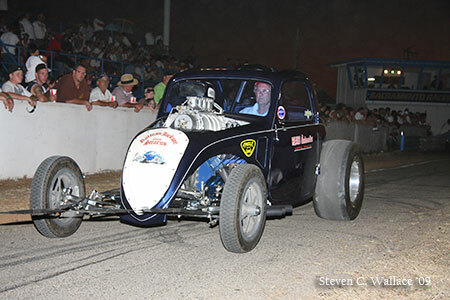 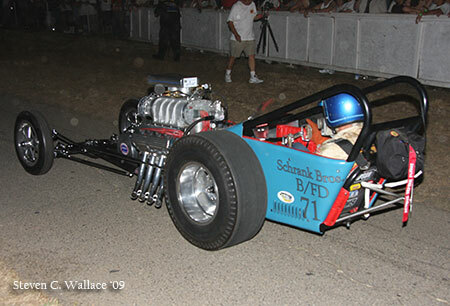 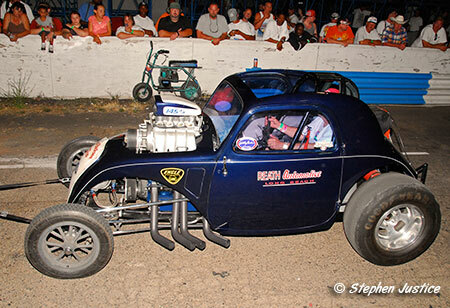 Original driver Jesse Schrank in the Schrank Bros. B/FD. 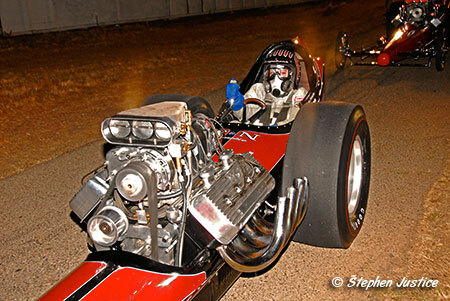 Ron Stearns in the Ratican, Jackson & Stearns A/FA. 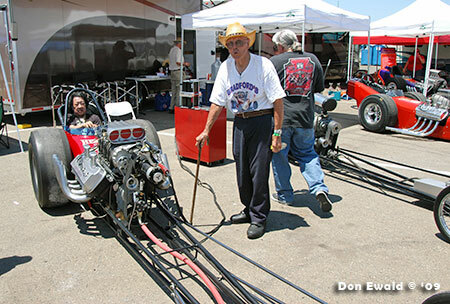 Oldest car - oldest driver. 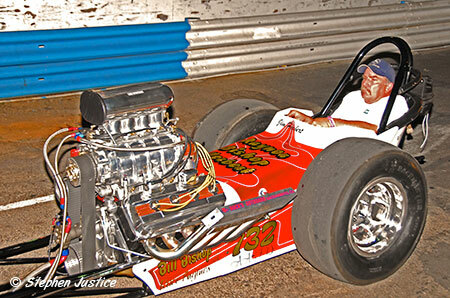 Ed Cortopassi in his and Doug Butler's "Glass Slipper". 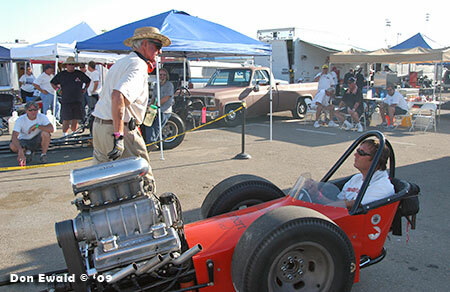 With the ten push start cars poised and ready at the finish line, and the two self start cars (Anaconda and the Ewell-Bell car) plugged in and ready, Don Ewald (with the self starters) gave Geno and Gibbs the signal to let the games begin. 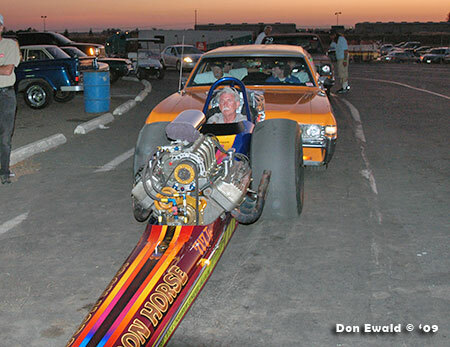 The first car down was the Iron Horse. 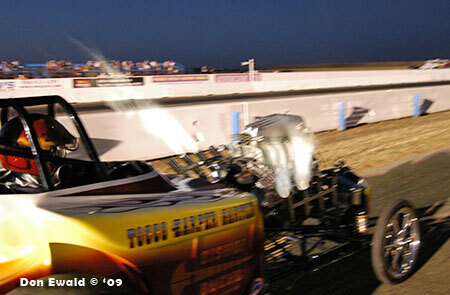 When Chastain was lit the two self starters got the signal to lite. 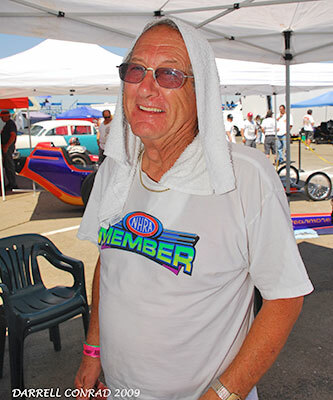 Second down was Roger Garten. 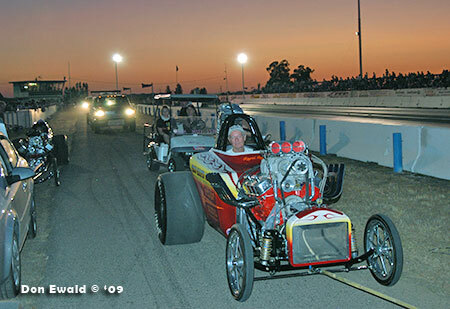 The cars made the turn from the track to the return road and lined up nose to tail behind the self starters who were at the 1000' mark. 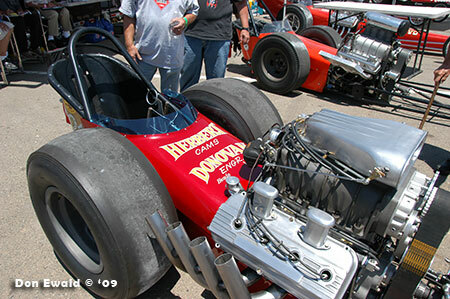 This format gave the fans a real up close and personal look at the cars. 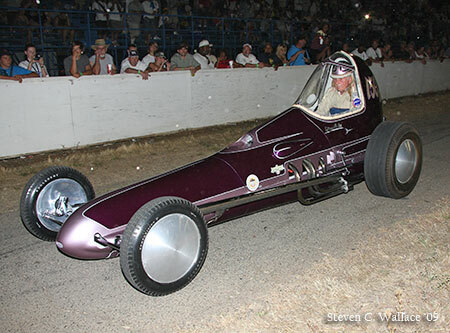 Sam Chastain in the Iron Horse,which is almost entirely original from seat belts to blower belt and everything in between. 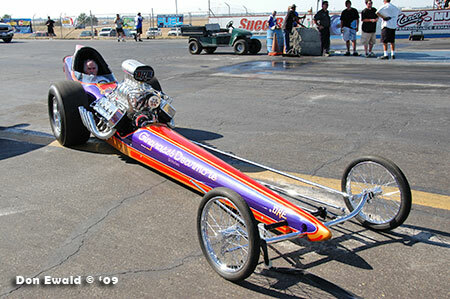 Following Garten was Ronnie Hampshire. 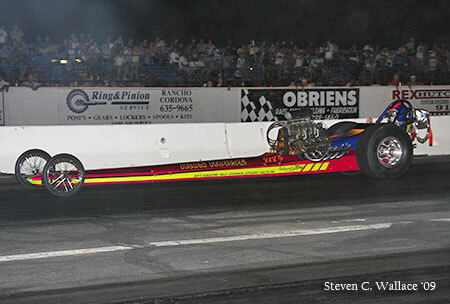 Jessica Anderson heading up in the Vagabond. 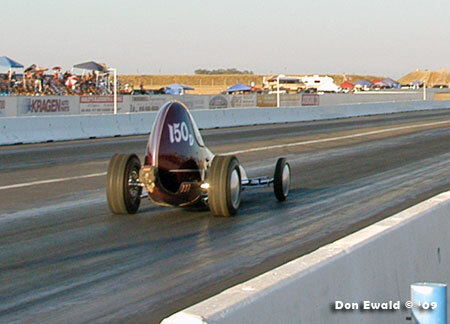 Following Anderson was Kol Johnson. 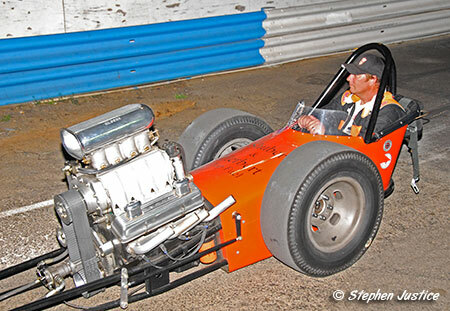 Followed by McCormick in the other Johnson car. 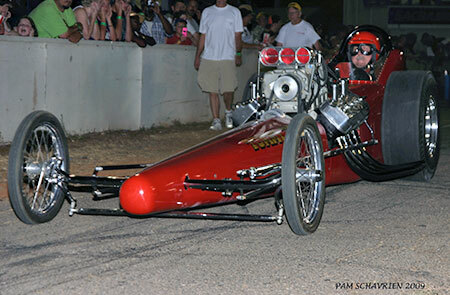 Jesse Schrank on all eight. 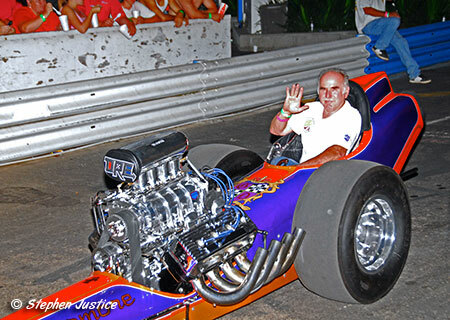 Ron Sterns failed to fire. 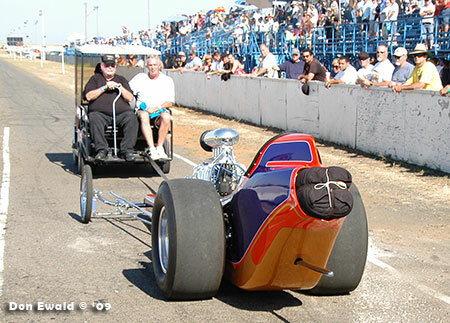 Last down - the Glass Slipper. 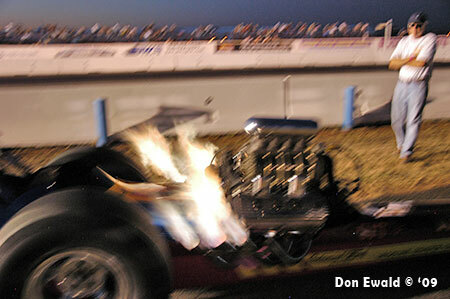 From that point on it was just shoot who ever was still running. 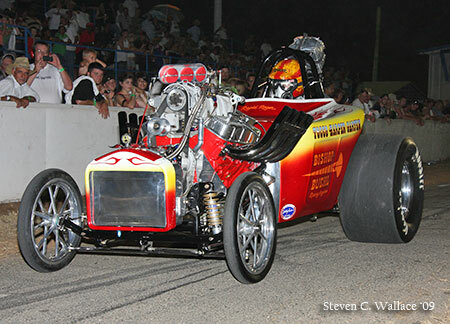 The Barnstormer doesn't make much flame with the weedburners and race tune-up, but the noise is awesome. 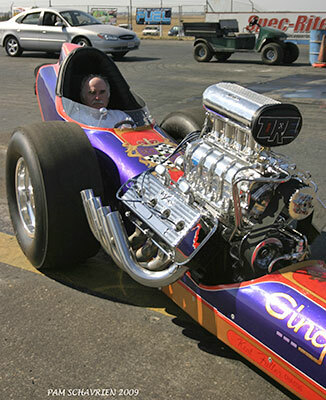 Ron Johnson stands behind with fingers firmly in ears. 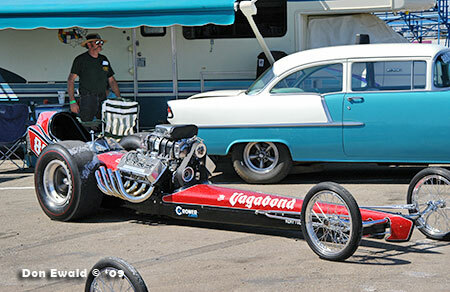 The last car running was the Vagabond and when i went silent the crowd went nuts. 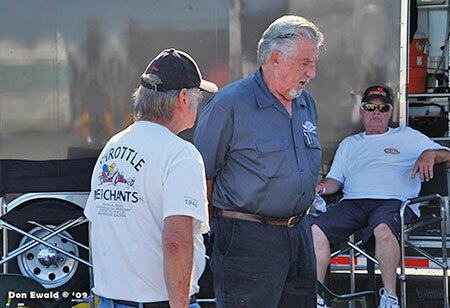 "Get me out of this firesuit!"